Suspected gunmen attacked an Indian air force base near the border with Pakistan early Saturday, security officials said, with at least two of the militants killed and fighting ongoing. A top security official, who asked not to be named, told AFP that the gunmen were believed to be from the Jaish-e-Mohammed Islamist group, describing them as suicide attackers who breached security at the base in the northern state of Punjab while wearing army uniforms. Kunwar Vijay Partap Singh, director general of police in Punjab’s Pathankot district, told AFP that the attack began around 3:30 am (2200 GMT Friday) and that there were four to five attackers. “The gunfire is still going on,” he told AFP. “Two of the attackers are believed to be dead in the gunfight while the rest are holding out inside one of the buildings in the base,” he said. He added that there had been no damage to fighter planes at the base. The unnamed security official, who was on the scene, also said that security forces had so far prevented the attackers from inflicting major damage. “They are heavily armed and the attack is aimed to cause maximum damage to the equipment at the station but we have been successful so far,” he said. Authorities had put the state on high alert on Friday after five gunmen in army fatigues hijacked a car driven by a senior police officer, which was later found abandoned on the Pathankot-Jammu highway, an important road link connecting the restive neighbouring region of Kashmir with India’s plains. It was not yet clear if there was any link with Saturday’s attack. In July, three gunmen dressed in army uniforms opened fire on a bus and then attacked a police station in the nearby Gurdaspur district of Punjab, killing seven people including four policemen. 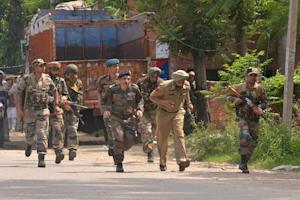 India blamed Pakistan-based Lashkar-e-Taiba (LeT) militants for that attack. Since independence from Britain in 1947 India and Pakistan have fought two wars over Kashmir, a Himalayan territory they both occupy in part and claim in full. India regularly accuses Pakistan’s army of providing covering fire for rebels who infiltrate across the border and then mount attacks in the Indian sector of Kashmir. And while insurgents frequently target police in the volatile Kashmir region, Punjab, a majority-Sikh state, has largely been spared the violence. New Delhi suspended all talks with Pakistan after Islamist gunmen attacked the Indian city of Mumbai in November 2008, killing 166 people. The attacks were later found to have been planned from Pakistan. The two nuclear-armed states agreed to resume a peace process in 2011 but tensions have spiked over the past two years, with cross-border shelling over the disputed border in Kashmir claiming dozens of lives since 2014. 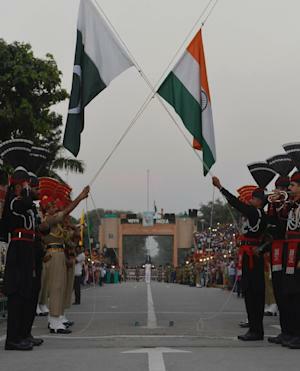 Frosty relations saw a thaw last week when Indian Prime Minister Narendra Modi made a surprise visit to Pakistan to meet his counterpart Nawaz Sharif on his birthday. The two countries decided to start a dialogue process to resolve outstanding issues, with the foreign secretaries of both countries scheduled to meet in Islamabad later this month.